The Mount Rogers Health District is on the road to good health! 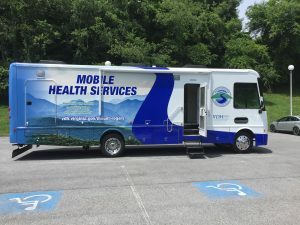 Staffed by Nurse Practitioners, Public Health Nurses, and Health Educators, the mobile medical unit provides onsite health screenings and fairs to people in our local health department offices, schools, worksites, and other community locations. Health education programs are also available and arranged to meet specific needs identified during the screening process. The Wellness Team also conducts community projects including Fit For Life, promotion of healthy food and snack options at convenience stores, and creating breastfeeding opportunities at community locations, including local high schools. Consultation is also available regarding Worker’s Compensation, light duty, and other related issues.